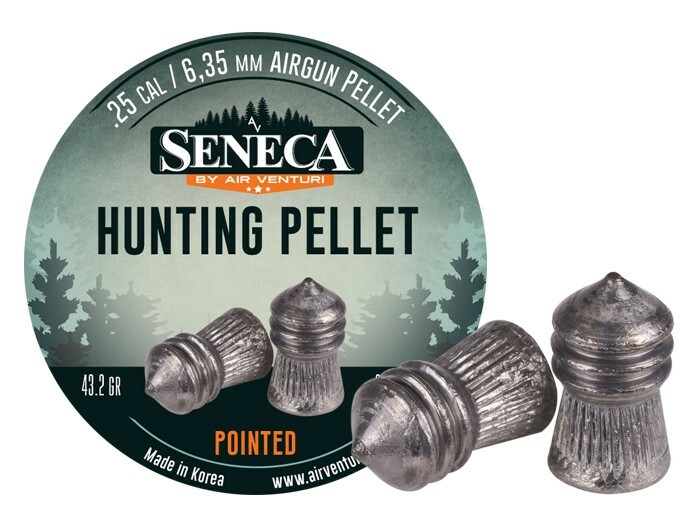 These .25 caliber pellets from Seneca deliver the power and performance you need for small game hunting or target practice. Each pointed round weighs in at a heavy 43.2gr. 83 pellets per package. Things I liked: Shoot extremely well, very tight groups. What others should know: Very tight groups and consistent ES, ugly pellets - several deformed, some kind of oily substance lines the tin along with flecks of lead, despite all that my Gauntlet loves them!! Is your .25 cal Guantlet factory or has is been modded? I had read and watched some reviews on the guantlet in .25 cal and all the reviews I read stated that they are not accurate in the Guantlet. I have a Gauntlet in .25 cal also and might be interested in these if they do indeed shoot well in the Guantlet. Where is it legal to hunt deer with a .25 caliber air rifle? What is the overall length of this pellet?